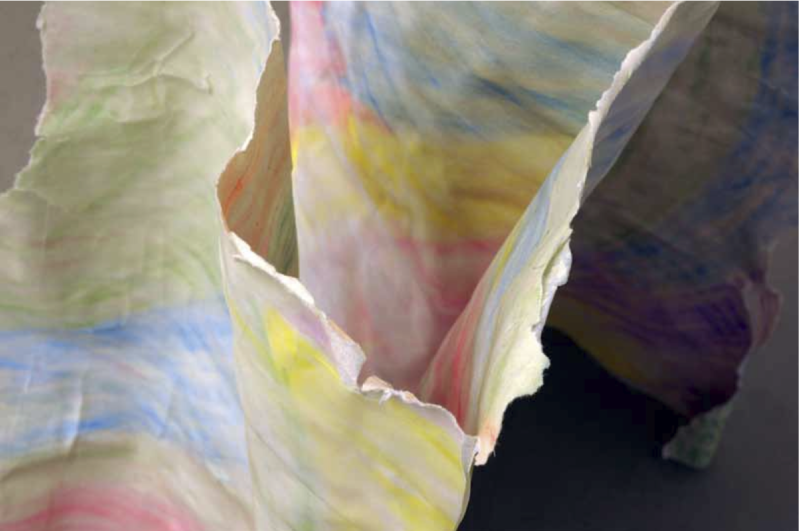 Karla Black often chooses to use materials that are see-through, like cellophane, polythene or sello-tape. 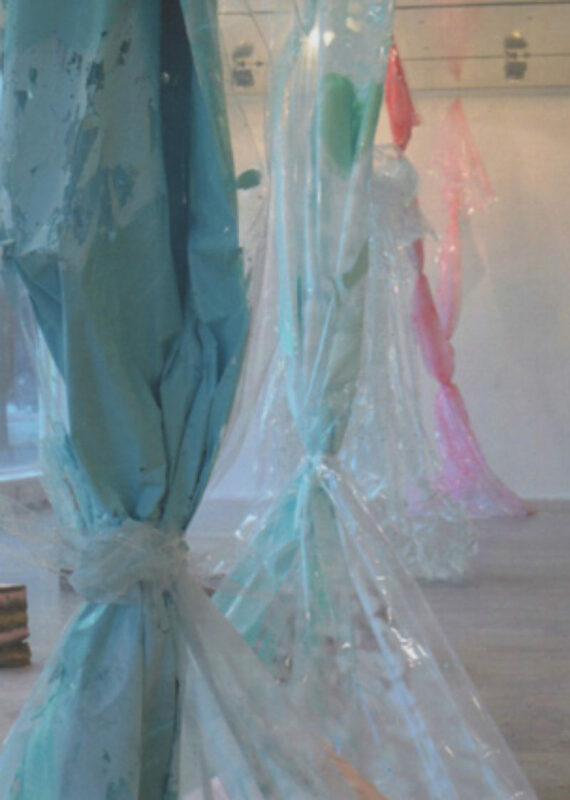 In her exhibition at Capitain Petzel, Berlin, during the winter of 2010, great swathes of cellophane soared towards the ceiling, then seemed to fall, draping and knotting in configurations that were large but light and airy. In works such as ‘After Words And Pictures’, ‘Locked’, or ‘not A Person In The World’, everyday material usually made to package sweets or wrap flowers is used on an industrial scale (and taken from an industrial roll) and deployed as pure gesture-filling space. The idea of a see-through material is very familiar—what else is glass or any of its plastic variants?—but also defies the kind of materiality we associate with other textured surfaces, whether it is a painted gesture on canvas, or chalk on sugar paper, or for that matter any other opaque surface like a dusty floor or a textured wallpaper. Black tends to mix these effects together, and she often coats or fills her transparent drapes with coloured pigment or plaster. Cradled inside the cellophane, lying directly on the floor, there may be a polystyrene block coated with topsoil. It is sometimes hard to say whether Black’s work is awkward or elegant, lumpen or fragile, cumbersome or light. Often it is all of these things at once. Though the actual materials Black uses may be different, they are reminiscent of an historical avant-garde culture of materials. After all, Vladimir Tatlin, the Russian Constructivist, explored precisely these kinds of material contrasts like (transparent, smooth) glass versus (opaque, rough) plaster in his reliefs and counter-reliefs, breaking the logic of the wall or a corner of a room. The concept of ‘faktura’, as it was named, referred to both the process of making but also the material effect of the object —appealing to the touch as well as the eye. Faktura was a watchword for what was possible and what a revolutionary future might look like. In the classic modernist narratives of 20th century art, faktura, with all its materialist and revolutionary potential, was overlooked in favour of the purely optical gesture, a repression of the haptic most clearly evident in what came to be hailed as the triumph of American painting in the 1940s and 1950s. These accounts are characterised by a desire to separate sight from touch that nowadays seems hard to relate to even those post-war artists like Morris Louis or Helen Frankenthaler whose painting has been seen most powerfully to register the purely optical as such. Black’s work combines and confounds these narratives of abstraction. Her work is powerfully abstract in the sense that it resists symbols even as it seems to court certain kinds of metaphorical association. This can be seen most clearly in her deployment of a pictorial language of pure gesture, which is made possible not by the way she applies materials, but the way she physically handles them. The movements that have gone into making the work include hoisting, pulling, dragging, lifting, looping and knotting. But it is as if strenuous actions have left something that looks entirely effortless, as if it simply appeared in the gallery rather than being the remainder of some kind of performance that happened in real time. This is no performative origin of the work. I would even contrast it with the way we might interpret other more performative practices—for instance, in the 1970s, in the way Lygia Clark made use of large polythene sheets to scoop up and create relationships between participants in the collective actions she called ‘Biological Architectures’. In Black’s work it is not bodies but piles of powder paint or stacks of polystyrene that nestle at the ample base of a suspended loop of cellophane. And the gestures are not those of literal bodies but more evocative of the kind of painterly trace Frankenthaler once described as one of those ‘beautiful wrist motions’ that might be hard-won but which looks ‘as if it were born in a minute’, except now in three dimensions and magnified to fill whole rooms. The relationship between sculpture and painting is both intimate and precarious in Karla Black’s work. On the one hand, it would seem that she reverses the kind of metaphorics at play in colour field painting—what critics referred to as ‘soak-stained colour’ in the work of Frankenthaler and Louis invoked translucent veils, with liquid blooms or flares of pigment staining unprimed canvas. Frankenthaler was conventionally seen as the bridge between Jackson Pollock and the colour-field painters. As Louis put it on seeing her ‘Mountains and Sea’ in 1952, she was the bridge to what was possible. In retrospect, it is striking that, as a woman artist, Frankenthaler’s importance has been underestimated because she has been seen as a mere vehicle or conduit. It is almost as if Karla Black reclaims the expressive gestures of this type of abstract painting and in so doing reverses the terms in her favour. And in particular it is Frankenthaler’s paintings of the 1980s, rather than the 1950s, the ones where she added pungent spots and stabs of pigment to her translucent veils that return to haunt sculpture now. You could think of Black’s evanescent drops of cellophane as literal versions of Fran- kenthaler’s translucent veils—now material rather than immaterial, colour caking their surfaces, deepening here into a pungent abyss, lightening there in a powdery shimmer. But it would be wrong to over-stress the idea of simply literalising a pictorial aesthetic, as if her work is a negation rather than an extension of that same aesthetic. In fact, her work is every bit as expressive as a painting might be. In Black’s hands, materials are far from being merely literal. Cellophane seems to soar, as if it is immaterial, as if it defies all structure and, most of all, gravity. Through this and other materials she creates a different kind of metaphorics but one that is potentially as complex as that traditionally associated with modernist painting. This creates a feeling of elation out of quite unlikely and everyday materials. The work oscillates between sculpture and painting, materiality and immateriality. This is the ‘as if’ of all art that claims to be able to hold onto autonomous expression. The formal gesture has returned, but only under certain transformed conditions, the first and most obvious one being that it always exists in the context of a mise-en-scène, which is theatrical. The second is that there is always a degree of illusionism, by which I mean not a depiction of objects in the world but the fact that she often uses materials illusionistically rather than literally. A mountain of powder is falling, a drape of cellophane soars upward. Things that are heavy tend to seem weight-less, and vice versa. All that is solid does not melt into air, but pulverises into powder. This invokes Man Ray’s ‘dust Breeding’, his famous 1920 photo-graph of Marcel Duchamp’s ‘The Large Glass’, but now the dust is powder paint or pink plaster dust. What had been the ‘soak-stain’ of the colour field returns as dry pigment or parched earth, with the most matt material contrasting with the most shiny. Sculpture is redistributed along an axis that dissolves structure through the twin operations of transparency and pulverisation. When, in the 1960s, Robert Smithson claimed ‘separate “things”, “forms”, “objects”, “shapes”, etc, with beginnings and endings are mere convenient fictions: there is only an uncertain disintegrating order that transcends the limits of rational separa- tions’, he was proposing a form of ‘infra-criticism’ beyond mere formalism but nonetheless adequate to the vertiginous effects of the artwork, the kind of effects that made ‘ideals leak’. In Black’s work, like Smithson’s so-called ‘pulverisations’ or his mirror and earth installations, it is sometimes hard to tell where one work ends and another begins. Yet they are separate works and it is that ‘leakage’ or spread—vertically or horizontally—that orientates us as spectators. Rather than Smithson’s dystopian vision of disintegration, however, we are invited to think also about what holds the work together. Contradictory though it might sound, decay and disintegration become an essential part of the creative process, signalling the work’s temporal as well as spatial dimension. Aside from being transparent, the main characteristic of cellophane is its shine, the way it glistens and reflects and refracts the light. And, if you stick with the work for long enough in the gallery, you see that as the light fades it becomes illuminated and the shapes seem to take on more substance, and become even more theatrical. Black sees cellophane as a transparent kind of paper, rather than as a plastic—appealing because, not in spite of, what she calls its ‘paperiness—the way it crinkles in a sharp, brittle kind of way’. Look up and there is a huge transparent bloom of cellophane. Look down and there is a small mountain of pink powder rising from a paint- spattered hammock-shape resting on the floor. Acrylic paint and chalky emulsion decorate the sheets of cellophane, colouring them mint green or pale blue, but also take the shine off them, making them matt and opaque. 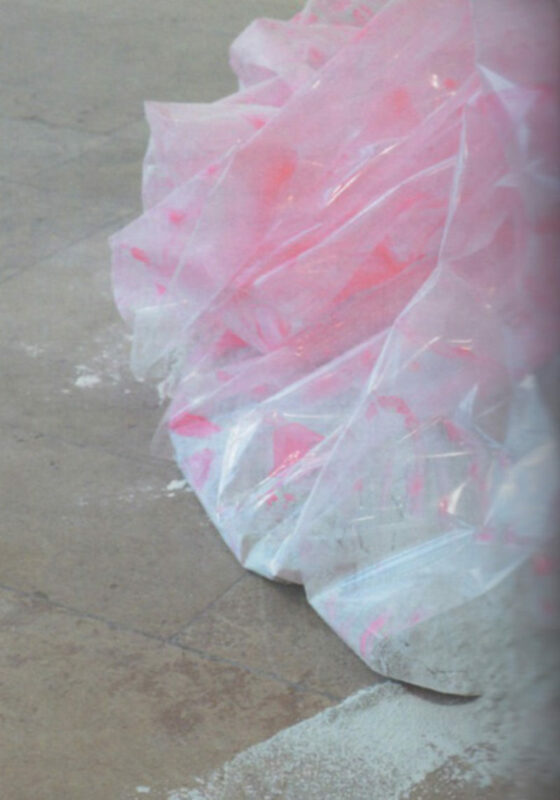 Karla Black’s work has been seen to reference cosmetics and a cultural lexicon of femininity. In the past she has often worked with various kinds of make-up as her material—using the chalk colour palette offered by vast quantities of pale blue eyeshadow, or pale pink face powder, or the congealed textures of coarsely ground-up concealer or bits of Vaseline. But I think the point to stress here is that she uses them for their specificity as ‘sculptural’ materials. The colour does not make direct symbolic references so much as obliquely refer to our experience of certain kinds of colour and texture. Her use of chalk also carries powerful associations with the memory of the art store cupboard in any primary school as much as with make-up. Its smell and touch return in Proustian fashion, as a mnemonic or token of infantile creativity. She even uses chalks on sugar paper in many of her sculptures as if this set of materials and colours can tap into some infantile level of experience within us. Shut your eyes and the sensory over-load of childhood seems to bear in on you, like being in an airless cupboard. Open them, and there are no interiors to be shut in by. There is only the play of open spaces. You move between the pictorial traces and gestures, rather than look at them. References are layered and open instead of than closed and fixed. Colours seem to echo the blues, yellows and turquoise of the tile work on the modernist façades of the gallery street on Karl Marx Allee, thus indicating that colour is entirely contingent and mimetic in only the most elastic sense. In contrast with the vertical drops of cellophane, a series of smaller objects sit directly on the floor like giant cakes or miniature earth-works—mixing topsoil with powder paint and small chunks of soap in jewel-like colours. They look temporary and sit on the ground like ungainly and useless bits of furniture or giant pieces of layer-cake. Compared with the suspended transparent drapes, which fold over or buckle in on themselves, hovering momentarily in mid-air, these floor-bound pieces are almost excessively material and awkward. It is as if everything takes on a bloom of some sort—whether as an organic growth or as some kind of layer on the surface of the skin of a fruit or a cheek. The idea that an earthwork has been displaced from a desert landscape and brought inside, and to a psychic interior at that. In the 1960s, Robert Smithson had developed a psycho-geological vision of dystopia—all mineral strata and crystalline structures. Black’s strata, on the other hand, are part of another metaphorics of natural fluorescences and luscious moulding blooms. 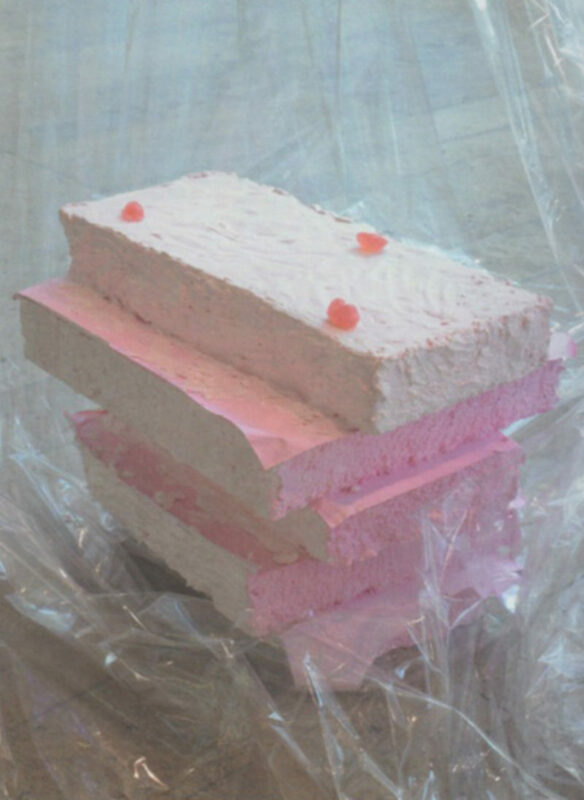 These associations combine with a language of orality and food—even the words ‘caked’, ‘frosted’, ‘flaked’ or ‘iced’ (quite aside from the resemblance to a section of cake) make these volatile connections to an almost edible terrain of bodily desires. These are strange organic landscapes made out of paper, both opaque and transparent, and paint, in both liquid and powder forms. Installed in Berlin, the see-through materials both mimicked and subverted the huge walls of windows of the modernist architecture of the gallery, originally built in the 1960s as the Kunst im Heim or gallery of the ‘art in the home’. Glass architecture has long been associated with the phantasmagorical effects and the enchantments of a commodity culture. The original gallery had been a design showcase for the German democratic Republic, a piece of window dressing for sure, but equally powerful in demonstrating the seductions of modernist design. In 2010, this glass shell is filled with Black’s both swaggering, and yielding gestures made from tacky glittery cellophane. The effects are beautiful in their scintillating lustre but also, lined as they are in colour, their surfaces seem to be in a state of disintegration and decay. As if to dramatise that, there is powder left all around the radiators and the edge of the space. dust is still breeding. Colour is pulverised. Powders bloom. Despite the effects of evanescence, the sense of physical involvement in Karla Black’s work is still strong, and it is important that it is her own. She is interested in play, but in the sense of a pre-linguistic infantile activity that is activated by the drives. It does not invite participants to ‘play’ with it—rather the pieces often stand in melancholic isolation, combined with other pieces but also separate from them. Bits of pigment are stranded between layers, piles of powdery plaster trapped in stage-set drop cloths. Sure, there is theatricality, partly because the cellophane suggests display, but also partly because of the scale and the movement and the fact that this is not work that one can look at but which you necessarily inhabit as sculpture. The works are discrete sculptural objects yet they always presuppose a certain mise-en-scène —as if this is the necessary condition of any art for which a plausible claim for autonomy can be made today. Karla Black asks why can’t you love both Helen Frankenthaler and Jeff Koons, why does it have to be one or the other? Koons’s shiny kitsch inflatables are generally regarded as aesthetically completely incompatible with the expressive pictorial gestures so bound up with high modernist notions of autonomy—the opposite in fact—the one a negation, even, of the other. Her question suddenly shatters the normal orthodoxies of what I think I know—the ‘why not?’ of the artist’s question precipitating a sudden convulsion of recognition. The ‘why?’ tendency of the art historical imagination likes to differentiate and compartmentalise even when it does not succumb to creating schools and movements. What she suggests is a strange marriage for sure, but all the more liberating for that. Black’s question invites us to think, not about specific influences on her work—or not only that—but much more broadly about the legacies of 20th century painting and sculpture for art now. Her work makes it possible to see affinities between things and possibilities for art today which were for a long time thought to be impossible—the possibility for an aesthetic that is both utopian and materialist, both pictorial and sculptural. In new and innovative ways, her work opens up a field of possibility for rethinking the expressive gestures of colour-field painting in the light of a material language of popular culture. The legacies of lyrical abstraction find themselves playing out no longer in painting itself, but in sculpture in its most expanded and expansive sense. Perhaps this is what creativity can mean now: the means to reclaim the ‘as if’ of the abstract—not in order to create a system of referencing objects in the world, but of creating a pictorial world that is fully sensual without the need for depiction.